Worthy of a day out to the seaside, a visit to see the slightly larger than life-size statue of Eric Morecambe is a must. Unveiled by the Queen in 1999, the statue depicts Eric in one of his characteristic poses, complete with a pair of binoculars around his neck (he was a keen ornithologist). 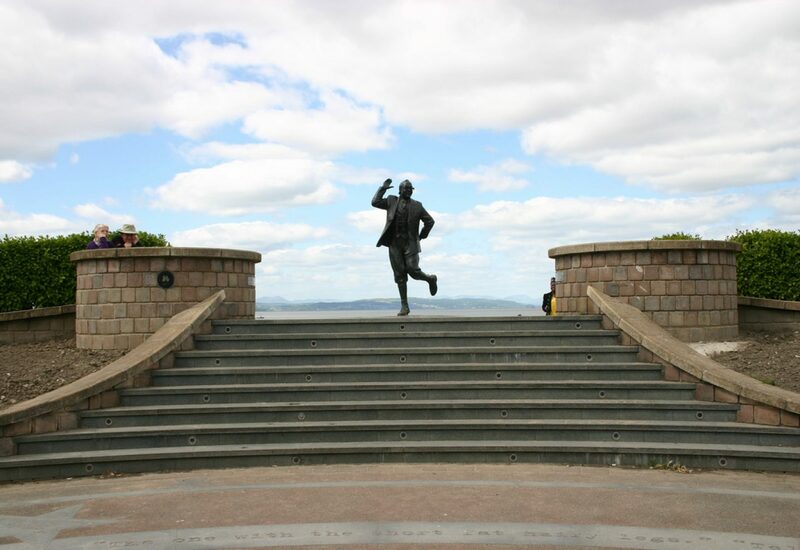 The statue is set against the stunning backdrop of Morecambe Bay and the Lake District hills, and perfect for that selfie moment – people queue to have a photograph taken alongside him. The statue and the arena below it are equally sensational at night, with superb lighting effects bathing the area. For more information contact Morecambe Tourist Information Centre on 01524 582808. Exit the M6 Motorway at Junction 34 and follow signs for Lancaster. Join the one way system (Caton Road) and pass small retail park on left on approach to traffic lights. Continue straight ahead over Greyhound Bridge following signs to Morecambe. The Statue is located on the Central Promenade area. The nearest train station is Morecambe which is situated in the central promenade area on Central Drive a short distance from Morrison’s supermarket. An additional station is located at Bare, a ten minute walk from the east end of the promenade up Princes Crescent. Both stations are served by a frequent service from Morecambe to Lancaster. For more information call National Rail Enquiries on 08457 484950 or visit nationalrail.co.uk. The nearest bus station is Morecambe which is situated in the central promenade area on Central Drive a short distance from Morrison’s supermarket, with frequent local services available. For further information contact traveline on 0871 200 2233 or visit traveline.org.uk. 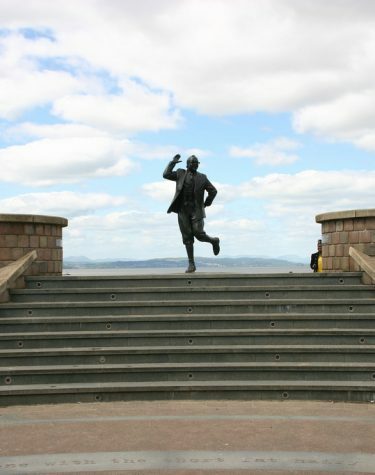 The buses 3 and 4 go along the promenade Monday to Saturday and the bus 3A on a Sunday, near the Eric Morecambe statue. The bus stop that is nearest the Eric Morecambe statue is the Clocktower stop. The train station is a 25 min walk away from the statue.